Ron and Matti would love to share their journey with you and bring you all the stories, resources, and experiences of this once in a lifetime opportunity. A total of 241 veterans from Minnesotans are buried at the American Cemetery in Normandy and in June 2013, teacher Ron Hustvedt (Mr. H.) and student Matti Martin ventured to Washington, D.C. and Normandy, France to participate in the "Normandy: Sacrifice for Freedom Albert H. Small Student-Teacher Institute." This website is a log of their journey, a record of what they've learned, and a gathering place for people who want to learn more about Minnesotans buried at the American Cemetery in Normandy. Click the red link above to read about Virgil Tangborn, a soldier we chose to eulogize in Normandy and honor with a website memorial in tribute to him. 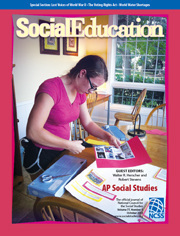 The Institute was recently featured in "Social Education" the official magazine of the National Council for the Social Studies. Read all about it by clicking here!